In the first match at 3 PM, Don Bosco’s Goa played against St. Britto’s Goa. Both teams spent the first half battling out against each other . However both teams fought harder to take it up a notch thereafter and St Britto’s Goa took the lead in the 46th minute through a penalty which was converted by Lloyd Mascarenhas. St. Britto’s Goa won the match 1 – 0. In the second match of the day, Loyola’s High School Margao played against St. Stanislaus Mumbai. It was a very fast paced and exciting match with both teams having several shots on goals that they could convert during the first half .Johan Gracias opened the scoring for Loyola’s with a perfect header off a corner-kick in the 30th minute and Altroy Rodrigues scored an elegant field goal in the 41st minute. However, David Cason of St. Britto’s pulled one back in the 48th minute. 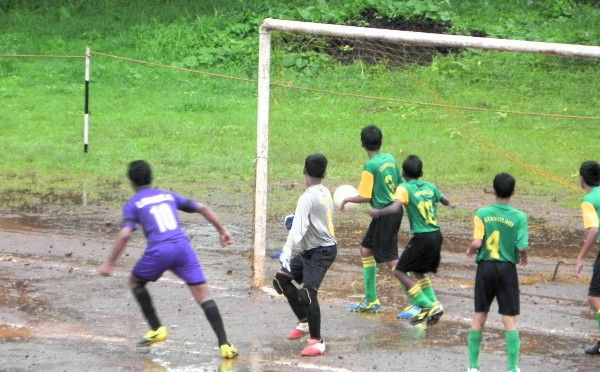 Loyola’s High School Margao won the match 2 – 1. Tomorrow, 20th July, at 3 PM St. Britto’s Mapusa will play St. Stanislaus Mumbai and at 4 PM Loyola’s Margao will play Don Bosco’s Panjim.